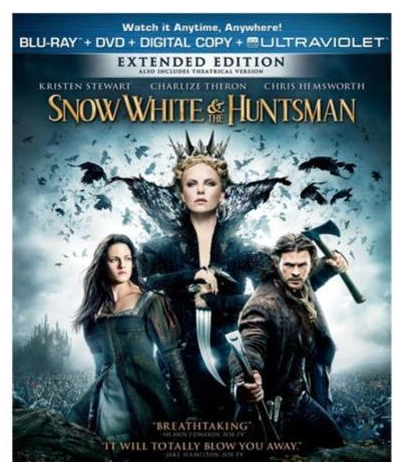 Snow White & The Huntsman Blu-ray + DVD Just $7.00! Down From $14.98! You are here: Home / Great Deals / Snow White & The Huntsman Blu-ray + DVD Just $7.00! Down From $14.98! Right now you can get this Snow White & The Huntsman Blu-ray + DVD for just $7.00 (Reg. $14.98) at Walmart! In the epic action-adventure “Snow White & the Huntsman”, Kristen Stewart (“Twilight”) plays the only person in the land fairer than the evil queen (Oscar(R) winner Charlize Theron) who is out to destroy her. But what the wicked ruler never imagined is that the young woman threatening her reign has been training in the art of war with a huntsman (Chris Hemsworth, “Thor”) who was dispatched to kill her. Sam Claflin (“Pirates of the Caribbean: On Stranger Tides”) joins the cast as the prince long enchanted by Snow White’s beauty and power. The breathtaking new vision of the legendary tale is from Joe Roth, the producer of “Alice in Wonderland”, producer Sam Mercer (“The Sixth Sense”) and acclaimed commercial director and state-of-the-art visualist Rupert Sanders.